Peter L. Jensen dedicated his life to innovation and today's Jensen® musical instrument speakers continue the essence of that innovation. Peter L. Jensen was born in 1886 in Falster, Denmark and came to America in 1909. 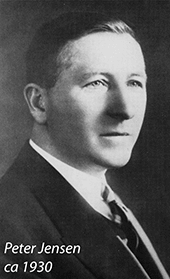 In 1915, working alongside Edwin Pridham, Peter Jensen developed the "Magnavox", the first loudspeaker. Magnavox speakers were predominantly used for public address systems, famously first used publicly in 1919 to amplify President Woodrow Wilson's speech in San Diego. In 1927, Peter Jensen founded Jensen® Radio Manufacturing Company and began producing speakers for both military use and radios. The company later began to produce commercial loudspeakers for public use. In the mid-1940s Leo Fender developed one of the first guitar amplifiers and chose Jensen® speakers for their excellent tone. Throughout the 1940s, 1950s and most of the 1960s, Fender®, Ampeg®, Gibson® and all the other major amplifier companies used Jensen® musical instrument speakers. Jensen® ceased production of their loudspeakers in the late 1960s. In the late 1990s, under a licensing agreement, SICA Altoparlanti, an Italian speaker manufacturer, commenced production of the legendary Jensen® speakers. These Jensen® "reissues", after intensive research and analysis, are made to the same specifications as the original Jensen® speakers used by Leo Fender and others. Following the success of these reissues, Jensen® has released new speakers utilizing the same quality design as the original Jensen® speakers, but dedicated to modern music, including speakers in the Jensen® Jet Series. The Jensen® name is synonymous with classic vintage tone, and is the pioneer in modern state-of-the-art speakers today.